After three nights in Bangkok, I was dying to get away from the city that was starting to feel like a friend who had overstayed their welcome. 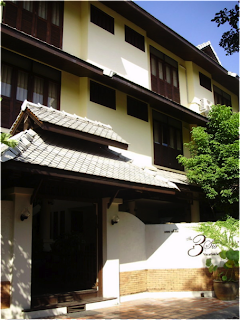 Arriving in Northern Thailand, Chiang Mai was a sanctuary for this weary soul. It's a beautiful town situated in the mountains, with lots of small shops, markets, restaurants, cafes, and outdoor activities. There are lots of cheap choices, but it depends on your departure point. Flights are available from Bangkok through Nokair and Air Asia for about $50, but can be even cheaper if booked months in advance. Bangkok Air offers more comfort on their boutique airline, but at a higher price. I took the first class overnight train from Ayutthaya, which was about $45 and saved me the cost of a hotel for that night. Although I'm a bit of a princess, I really enjoyed the train and got a good night’s sleep! The first class cabins are private, air conditioned and serviced by a train attendant. It was also pretty awesome watching the sunrise from the last car. Book your train tickets in advance with a travel agency and go first class! For the extra $20, you can avoid having a cockroach nest under your bed in second or third class. 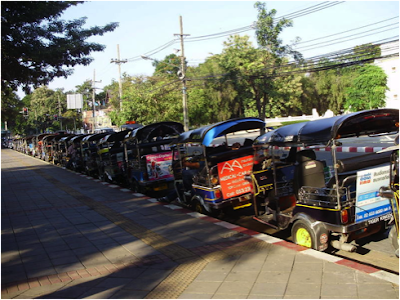 You can mostly walk around Chiang Mai, but jump in a tuk tuk for longer distances (right). A word about tuk tuks – make sure you negotiate your price before getting into the vehicle. Usually, the driver will propose a ridiculous price to start – don’t take it. Stand your ground, insist on a reasonable price, and walk away if they refuse to budge. We loved staying at the 3 Sis, a gorgeous B&B (above) in the centre of town and across the street from Wat Chedi Luang temple. For $40 a night, you get an air conditioned room with a comfortable bed and private bathroom, along with a hearty breakfast included. 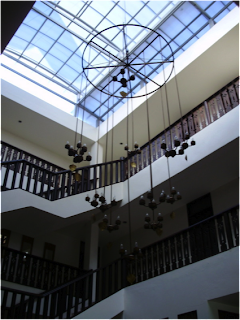 The staff are highly knowledgeable and go above and beyond to care for their guests. One night, we had to phone home at 1 AM and the staff arranged for a security guard to accompany us to the pay phone on the street. Another plus – laundry service is only about $7 per load. Don’t miss trying your hand at cooking Thai food. 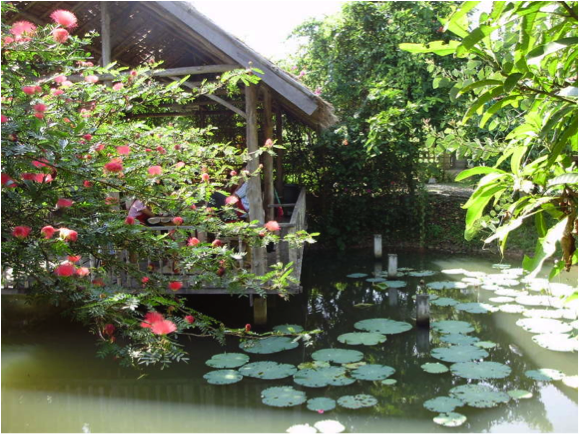 There are a gazillion cooking classes in Chiang Mai, but I chose the Chiang Mai Thai Farm Cooking School – the only school on an organic farm. 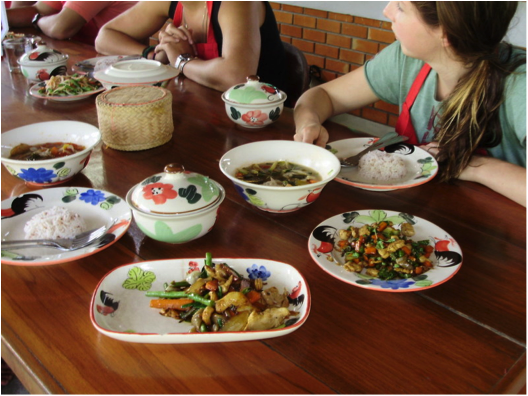 A full day course costs about $40, which includes your transportation, food and cooking supplies and a visit to the local market to learn about Thai ingredients. It’s also very veggie friendly. Upon arrival, the cooking instructor took us on a tour of the farm, explaining the ingredients, how to pick them and how they actually grow. 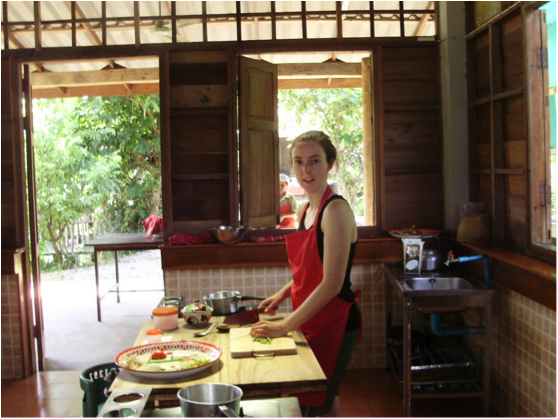 Then we donned aprons and selected six Thai dishes to prepare at our individual cooking stations. The best part was sampling my food while relaxing in the beautiful countryside! See the farm above. I also appreciated the doggie bag for my pad thai since I was stuffed by the end of the day. Chiang Mai is a hub for small shops that sell jewellery, gemstones, cashmere, and silk for lower prices. 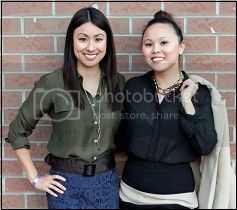 I had a Chinese silk dress tailor-made for about $100. Also, don’t miss the Chiang Mai Night Market for lots of kitschy souvenirs! I spent a full day biking 25km down Doi Suthep Mountain through off-road terrain in the jungle. This was thrilling, but also scared the bejesus out of me! The "road" consisted of steep hills and shards of concrete protruding through the ground. 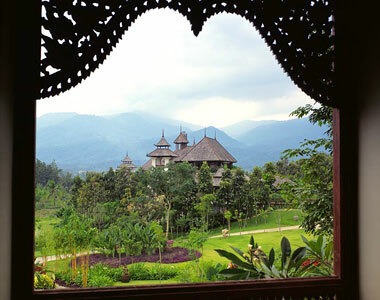 But I was gobsmacked by the stunning views of the mountains, rice fields, and coffee plantations. The day wrapped up with a relaxing meal by the lake. 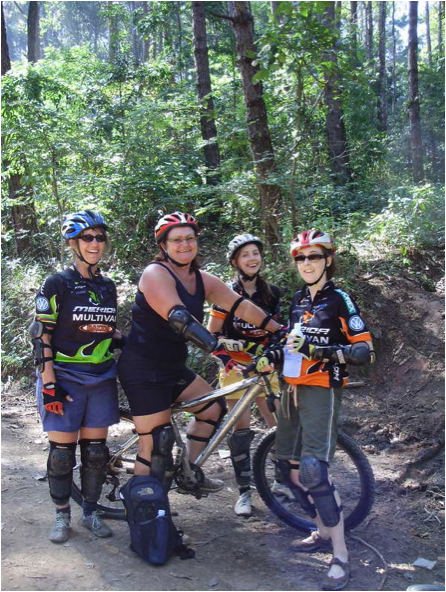 Unless you are an experienced mountain biker, I recommend going with the beginner group. There are tons of local biking operators – go with the package that best suits your level and needs. As a boxer, this was on my "must see" list. We got tickets through our hotel to watch a youth match. I quickly realized that I would never want to compete against 15-year old Thai boxers. This was not only entertaining, but also offered a glimpse into what the locals do after hours – a large proportion of the spectators were family members of the boxers and Thais who were placing bets. Bring pants with an elastic waist – you’re going to need them! The food in Thailand is simply amazing...spicy curries, coconut soup, pad thai, spring rolls, mango with sticky rice, cashew nut chicken, chocolate banana pancakes, chicken satay – the list is endless. 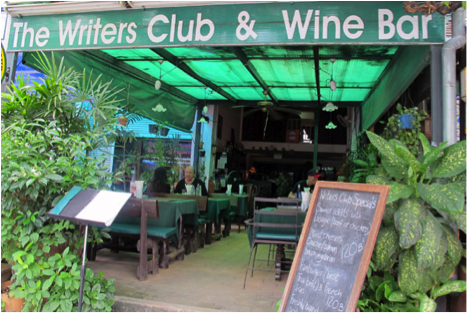 Check out the Chiang Mai Writers' Club & Wine Bar, a local hangout for "farang" (foreign) writers and journalists that also serves great Thai food. A tip for eating out: if you’re not a fan of heat, ask for not spicy when you order food. The dish will probably still have a kick, but it will be manageable. Also, if you ask for very hot, keep a glass of water handy. 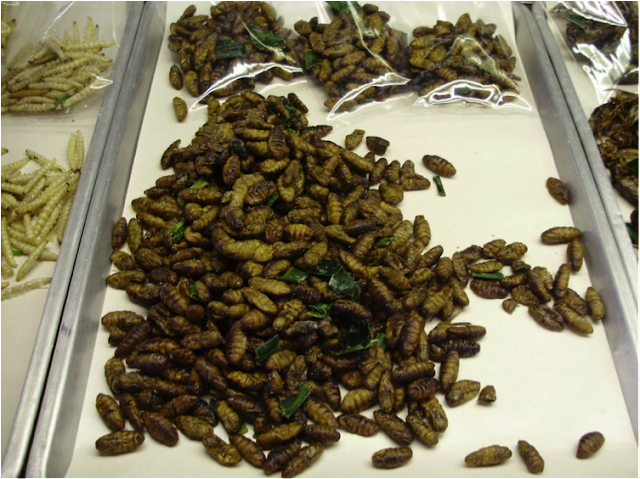 If you’re gutsy, try the deep fried insects!